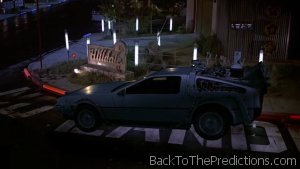 As the DeLorean lands near the Hilldale neighborhood, the sun has set and lights are on. 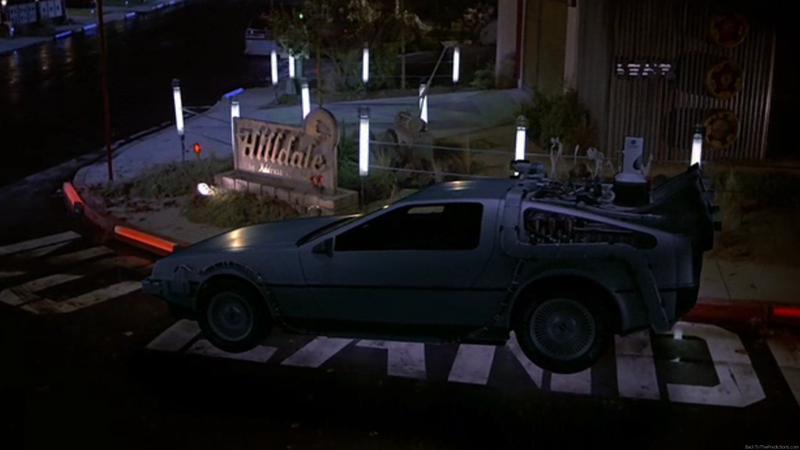 However, unlike Marty might be used to seeing in 1985, Hilldale has fluorescent lighting horizontally along the curbs of the street and vertical lights on fence posts. Red lights are on the curb on the street corner at no parking and/or no landing zones. Blue lights are along the curb where parking is allowed. The vertical lights appear to be decorative. In a world with flying cars, this sort of lighting makes sense. Light posts would get in the way of any car taking off or landing, so it’s best to keep lighting low like you’d see on an airport runway. These lights wouldn’t get in the way of a flying car and may also aid visual navigation from the air. We don’t actually have this sort of lighting in 2015. It’s impractical because the lights would be burning out often if they weren’t crushed under the tires of cars first. 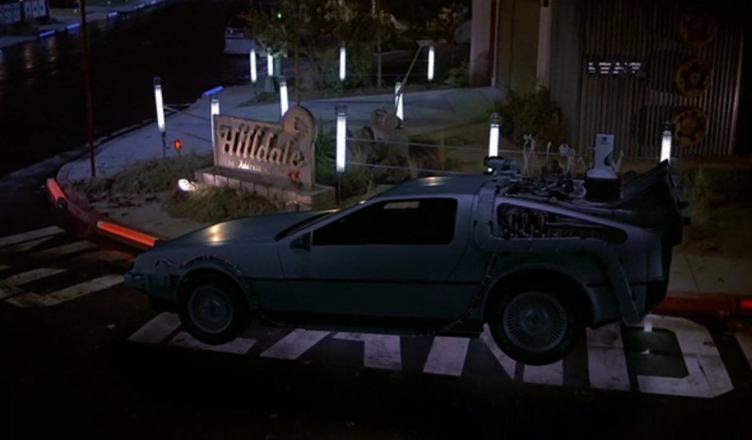 The lights are not part of the curb and stick out (likely because the Hilldale scenes were shot in an actual neighborhood, so the crew couldn’t integrate the lighting into the actual curb). This would make them particularly vulnerable to damage. In any area that gets snow, they’d get destroyed by snowplows.